Saturday night’s (Feb. 20) all-American concert by the Cincinnati Symphony Orchestra at Music Hall was exceptional – both for its choice of repertoire and the outstanding performance it received under music director Louis Langrée. A large crowd (near full house) was on hand for masterpieces by Charles Ives, Samuel Barber, Aaron Copland and Leonard Bernstein. 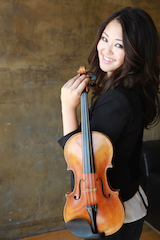 Exceptional as well was the CSO debut of violinist Simone Porter. Just 19, Porter took the place of the previously announced soloist, CSO concertmaster Timothy Lees, who had to cancel due to a stress injury. Porter exhibited total command of the Barber, mixing a gentle, caressing sound with impressive acrobatics. The second movement (Andante) was supremely nostalgic – compliments to principal oboist Dwight Parry for his touching solo -- building to a big orchestral climax before the soft ending. Porter took off lickety split in the Presto moto perpetuo finale and never let up, creating a big “wow” overall and eliciting an instant standing ovation. Centerpiece of the program was the Suite from Copland’s “Appalachian Spring,” given as fine a reading as this listener has ever heard, one marked by sensitive color, dynamics and ensemble. The soft beginning cast a spell leading to the “big theme,” begun by the strings (lustrous throughout the concert) and taken up by the brass. Oboist Parry introduced the frisky, dance-like section in which he and associate concertmaster Kathryn Woolley shared a lovely duet. The famous Shaker hymn, sounded first by principal clarinetist Jonathan Gunn, built to a huge statement by the full orchestra, succeeded by soft strings. The work ended softly, as it began. This was followed by the Symphonic Suite from Bernstein’s music for the 1954 film “On the Waterfront” (a CSO subscription concert premiere). The 11-minute score mixes violent and tender moments, corresponding to the action of the film, opening with a lovely solo by principal French hornist Elizabeth Freimuth. Scored for a large orchestra, the colorful work also featured a wild mix by the percussion, idiomatic saxophone and warm strings with harp, coming to a big brassy end. The concert opened with Ives’ “Unanswered Question,” performed by four onstage flutes, a trumpet from the rear of the hall and offstage strings for a mesmerizing effect.